Every emergency vehicle, emergency room, emergency responder, fire or police has served someone who's in need of a communication aid. Here's an effective, inexpensive way for all first responders to be prepared for people who are not able to speak. 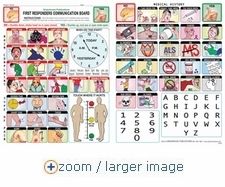 This communication board was designed specifically to meet the urgent medical needs of individuals who are injured and cannot speak, or do not speak English. Yes or No responses are all that's needed, even if it's "thumbs up or down" or "eyes open/closed" for yes and no's. The boards feature 50, hand-drawn, colorful icons depicting a patient's MAIN COMPLAINT, TYPE OF PAIN and MEDICAL HISTORY. The front side, top-half features MAIN COMPLAINT ICONS with a clock for TIME questions and answers. 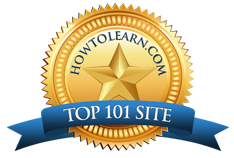 The bottom-half highlights icons for TYPES OF PAIN and a pain scale in the bottom corner. The backside features icons of one's MEDICAL HISTORY including medications, ailments and diseases, a number board and an alphabet for spelling. It always helps to know what medical issues a patient has and what prescriptions he takes for that condition - and others. In addition the boards offer the alphabet and numbers to help determine the what, where, when and why of a patients medical issues. Available as durable, laminated boards. Call 1-866-544-9540 for a discount on larger quantities.